David Yelland was at SJN from 1976-1981. After taking an Economics degree at Lanchester, David went into journalism and has worked for News Corporation since 1990. Until recently David was Deputy Editor of the New York Post, also doing work for BSkyB and fox TV. Brother Paul, also ex-SJN, is Art Director at Haymarket Publishing in London. David got to know Rupert Murdoch by interviewing him as Business Editor of the Sun and later worked with him through the night when news broke of Princess Diana's death to put together the next day's edition of the New York Post. In June 1998, still in his mid-30s, David was appointed Editor of the Sun, which has to be one of the most powerful as well as toughest jobs in British journalism. Described in press reports as "quiet" and "self-effacing" David seems in this respect unlike some other recent holders of the post - but so far, equally successful at attracting controversy. It will be interesting to see how the famous (or notorious?) tabloid develops under his editorship. "A few minutes ago I submitted my thesis and my viva is going to be sometime towards the end of November. I've applied for several Postdoctoral Research Associate positions. I should hear from them soon, until then I'll be back in Brigg." Recently however (until April '98) Scott was based at CERN, the European Laboratory for Particle Physics in Geneva. He was a member of the OPAL collaboration, working on "one of the detectors on the LEP (Large Electron-Positron) Accelerator", as he explains. Scott's e-mail address is here and his personal website is here. Good luck, Scott! "I look back with nostalgia at those heady days of the 60s and count myself fortunate to have attended such an excellent school with such excellent teachers..."
Malcolm's e-mail address is here. "I live at the Hole in the Wall, Bridge of Walls, Shetland. My house and the office from which I often work overlook a voe (fjord) full of seals and fish and birdlife, and the land stretches (almost) unfenced to the horizon. When the weather is fine there is no more beautiful place on earth." Of school Ken writes "The man who got me to Oxford was Basil Watts who (in my view) was an exceptional teacher with enormous reserves of encouragement. Of my friends at school I have lost track of them all, though I know David Bradbury still works in Scunthorpe. I would be delighted to hear news of John Peters, John Butterworth and Kevin Schirn, and of Ros Clarke, Pat Taylor and Penny Ellis." David Booth has e-mailed us from East Yorkshire (yes, we love to hear from you whether you are near or far!). He was at BGS from 1965 to 1972. David studied at Oxford and now works for Smith and Nephew in Hull and like the other David (above) came across our website.He is married to an ex-Girls High School lady (Vanessa Broadbent). They have 3 boys, and David is looking forward to news of contemporaries and staff through Briggensians. "...I worked as a Publishing Director in a London publishing company for 12 years and now run an advertising agency (specialising in promoting computer-related companies) in, wait for it... Brigg. I'm married to Anne-Marie and have two sons, Charlie and Jack, both at Brigg Prep. ... "
I'd love to hear from any of my old mates from school years, especially Ian Butler, Phil Bradburn, Mark Beckers and Philip Spring ... I keep in touch with John Gibbons, Tony Instone, Robert Lee, Chris Day, Graham Dixon and a few others and would be happy to put people in touch with each other. ... My sister Laura was at the High School and now lives in Greenwich and is married with two children. I'm sure she would be delighted to hear from any of her classmates. " How about a reunion for our year? Do please e-mail me." "My time is taken up with Samuel (3+), Naomi (2) and Joseph (4 months). I am also helping to co-ordinate a home birth support group. Naomi was born in our front room and Joseph into a water pool!" Husband Mark is Headteacher of a local school. Kirsten would love to hear from other Briggensians - members wishing to contact her should get in touch with John Hastings. "If any of my maths or science masters had bet on the least likely person to wind up in Silicon Valley, there's good chance that I'd have been that person..." After studying Modern History at University College, London, Martin worked in sales for ICL, then moved into the applications software world, working from 82 to 91 for two first-rate UK start-ups in the accounting systems arena. With the second of them, Systems Union, he ended up in California, opening up their San Francisco office. Now with an American wife, dog and child, Martin is Vice-President with a 200 person custom software development and consulting firm. Martin wonders whether there are any other Briggensians out there? He writes: "Maybe we could start the Silicon Valley Chapter of the Briggensians Association". If interested, send Martin an e-mail. Peter Welton, renowned and popular painter and Professor Emeritus of Fine Art at De Montfort University, Leicester, is as many will know an "old boy" of Brigg Grammar School. He has a web site which displays many of his paintings and through which you can order prints and send him an e-mail. Click the painting to visit his site (link updated). 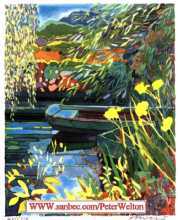 Meanwhile, here is a small example of his work, painted in Monet's garden at Giverny, to grace our pages. The class of '63, being Glyn Thomas, Anthony Gowers, Dave Carwardine and Jason Andrew, want to meet old boys from the same year for an ongoing summer evening reunion. If you do not have the phone number of Jason Andrew (Waltham, Grimsby), you can e-mail John Hastings. Did you start at BGS in 1968? See the message from John Cade! 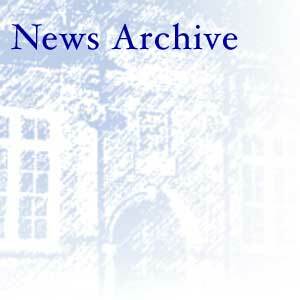 More older news is in the News Archive page 2.